Photo right: Skarlett Boleware helped increase attendance at her church by bringing in children from the community. Photo below left: The pews are filled with people at Lone Star UMC for the annual Christmas program. Four years ago, in the summer of 2012, some members of the congregation of Lone Star UMC were talking about their low attendance and that almost everyone was retired and many in their 80's. Lone Star UMC was formed in 1940. Over the 70+ years, the congregation had never averaged over 30 in attendance on Sunday morning. Attendance had declined to the low 20's on Sunday mornings. Their declining age brought about a great concern; they began realizing that the church would be dead in a few years if something didn't change. Skarlett Boleware, a shy lady in her early 40's, decided to do what she could. Skarlett began inviting children from the community to church. 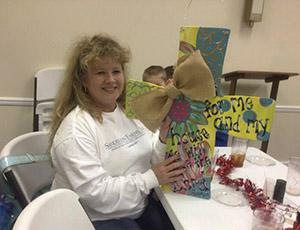 She began picking up children in her SUV and bringing them to Lone Star, having Sunday school with them, having Wednesday evening activities for them, and bringing them to regular church services. Skarlett would pick the children up and take them home every Sunday and Wednesday services. Also, she would take them to extra activities such as bowling. She soon had her SUV beyond capacity with children. A man in his late 70's (who has recently passed away) bought a 12 passenger van. The van was immediately used and soon filled; making it necessary that Skarlett again uses her SUV for transportation. This van has close to 300,000 miles on it right now, and it appears we will use it until it no longer runs. I became the Pastor of Lone Star in May of 2013. At that time, the van was full, and Skarlett was desperate for help. She had one young man helping her. Lone Star's PPRC immediately had made me aware of this situation, making it clear that they wanted to get parents involved and were not having any results in doing this. We immediately focused on this and gotSkarlett some help. Skarlett and I were able to recruit a young couple and a few others to assist her. The church had special activities to attract the parents such as children's programs and parent appreciation banquets to draw in parents. Parents have attended these events. For instance, we have our Christmas programs on Wednesday evenings since we can't get all our children to church on Sundays because of partial custody situations. The past three years have resulted in over 90 people showing up each year, one year with 123. This is with a sanctuary that will hold 60 comfortably and a fellowship hall that will hold 40-45. I watched amazed while the people of Lone Star fed 123 people in this little fellowship hall with ease. People would go through the line, eat, then go into the sanctuary. 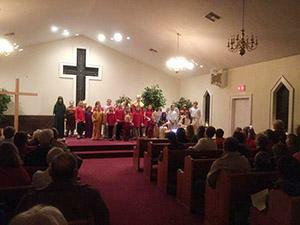 This retired congregation has been incredible with their support of these children. Over the 3+ years, I have been their Pastor, they have had only two adult events. I have encouraged them to do more for themselves, and my encouragement may be why they had these two events. Lone Star is simply very content in doing everything for the children. Every Wednesday, several work hard to make sure the kids and adults who attend are very well fed, never complaining, always seeing to the care of the children. Lone Star now owns two vans (both bought used). The second one was bought with cash last year. Our van ministry picks up many children who are very marginalized in the community. Great effort is spent loving such children and helping them adjust to our worship atmosphere. Lone Star does an amazing job in helping them adjust well, becoming important contributors to our worship experience. For instance, a brother and sister (4 and 5 years old) came to Lone Star when their parents dropped them off one Wednesday evening. Since then, they are at almost every service, whether their parents drop them off, or they are picked up by the van ministry. They have been more than a handful in adjusting to our services. With much effort and patience, they are adjusting well and are now raising their hands and asking us to pray for specific family members during prayer time. (These children were placed with social services since this letter). While we have had many cases of heartbreak, a few have felt like they would rip our hearts out. Some of these are even more grievous than the congregation realizes which I cannot share with them because of HIPPA and other regulations. I am glad that they do not have to know all I know. Please note that many of our children are in fact well taken care of at home. One of our retirees has become a regular van driver. He is 74 years old, and the kids love him! I have been able to join Skarlett on occasion to develop these children and youth. We have been able to experience 13 publically professing their faith in Jesus Christ for the first time and have baptized many of them. Lone Star is way above the typical 85% growth mark that many use to gauge building from. On Wednesday evenings, our fellowship hall is almost always beyond 100% capacity. In summary, I am very proud of the congregation of Lone Star UMC. I hope this brief explanation has properly represented how they have done a tremendous job of reaching out to their community and ministering to all who come in their doors. Lone Star now averages around 40 during Sunday morning worship and well over 40 on Wednesday evenings. Sunday evening attendance many times is over the average 30 benchmark they couldn't attain on Sunday mornings just 4 years ago.